This blog has been co-created by Demi Sanders and Will Chadbon. If you’re yet to make a New Year’s resolution, why not resolve to give blood? The NHS needs over 6,000 donations every day to treat patients across the country; that’s why there’s always a call for more people to step up. As a team, we gave it a try ourselves. But before we talk about our team experience, let’s start with the basics. Blood donation means willingly giving blood to help someone in need. You can either make an appointment online, or attend a local drop-in session. Your visit should last no longer than one hour from the moment you enter the door, to the moment you leave. The donation part itself will last between 5-10 minutes. Make sure to eat well and drink plenty of fluids before your appointment. There will also be plenty of drinks and snacks to enjoy whilst you rest up after your donation. 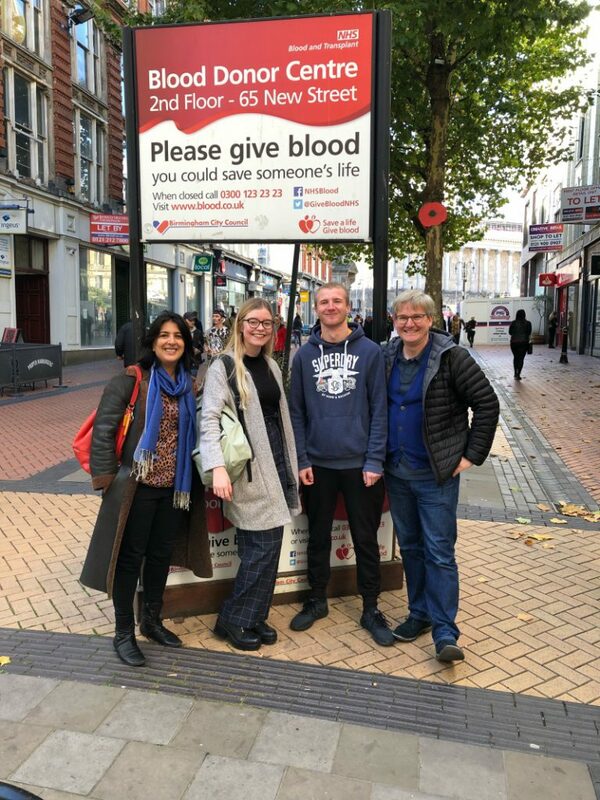 We visited one of Birmingham’s donor centres after choosing our slots online. We turned up willing (albeit a little nervous) and ready to give blood. Upon arrival, you will be asked to fill out a form to determine whether or not you can actually give blood that day. 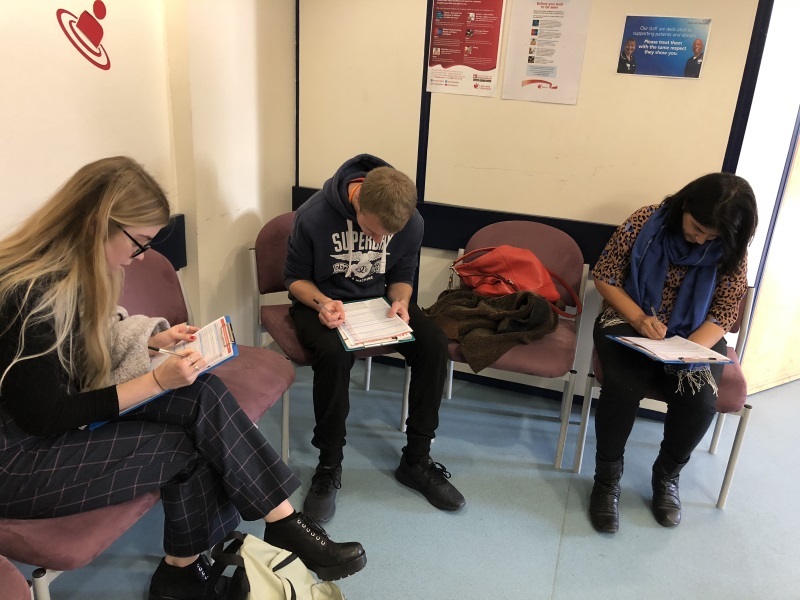 After filling out the form you will be invited into a small room to discuss your answers with a nurse. Here the nurse will flag up any answers that may prevent you from being able to give blood that day. Unfortunately, Mano and I didn’t check online prior to our appointment and it turned out we were unable to give blood at that time! The reasons being: Mano had recently holidayed outside of the UK and I had gotten my ears pierced a month or so before the appointment. Both Mano and I were advised to wait four months before next trying to give blood. At the time it was a bit disheartening because we had psyched ourselves up to become donors, but it all makes perfect sense and the nurses were very nice about it. Plus, we were still allowed to sit and support our colleagues, and even eat some of the sugary snacks, whilst we waited. Mano and I will be giving it another go this year! So, you’ve made your appointment online or turned up at your local drop in centre. You’ve filled out a short form, had a quick chat with the nurse, drank a glass of water and now you’re good to go. It’s time to give blood. There’s a small waiting area filled with those who have just given blood and those who are about to give blood. 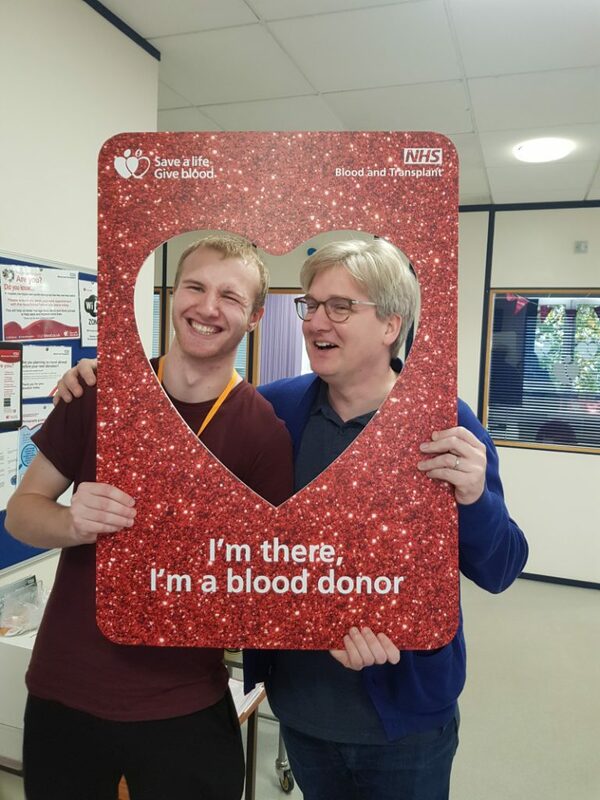 In the donor centre we attended, there were around 10 beds and our developer, Scott, was called up first and then our co-founder, Barry. A total of 470ml of blood was taken for the donation and rest assured, it’s no way near an armful! The nurses have done this a thousand times before and as you can see from the pictures below, both Scott and Barry were pretty chilled! You may feel slightly light-headed afterwards, but this is perfectly normal and should go away after some rest, drinks and snacks. If you fall ill with anything other than a cold or cold-sore in the two weeks following your donation, you can call this NHS helpline: 0300 123 23 23. Many people sign up to regularly donate but these people cannot donate forever and still more donors are needed. For this reason, the NHS seeks approximately 200,000 new donors a year. Mano and I spoke to some amazing people whilst waiting for Scott and Barry to make their donations. One lady had donates as many as 89 times! Another gentleman around 70 times. Touchingly, they explained how they planned their activities around blood donation. The lady who had donated 89 times knew she was having a hospital stay and wouldn’t be able to donate for a short while after. So, during this time she booked a holiday and got her ears pierced so she could reduce time off from giving blood. More young people are encouraged to donate to ensure a healthy blood supply for the future. Similarly, people with rare blood types and people from black, Asian and minority ethnic communities are urged to become donors. Currently only 1% of UK blood donors are black – a statistic that the NHS has been campaigning to change. You can find out more about the #ImThere campaign by clicking here. As a paediatric anaesthetist, Barry is used to being on the other side of the needle! What happens after you’ve donated? You’ll be provided with a mini guide to help you stay well immediately after your donation. 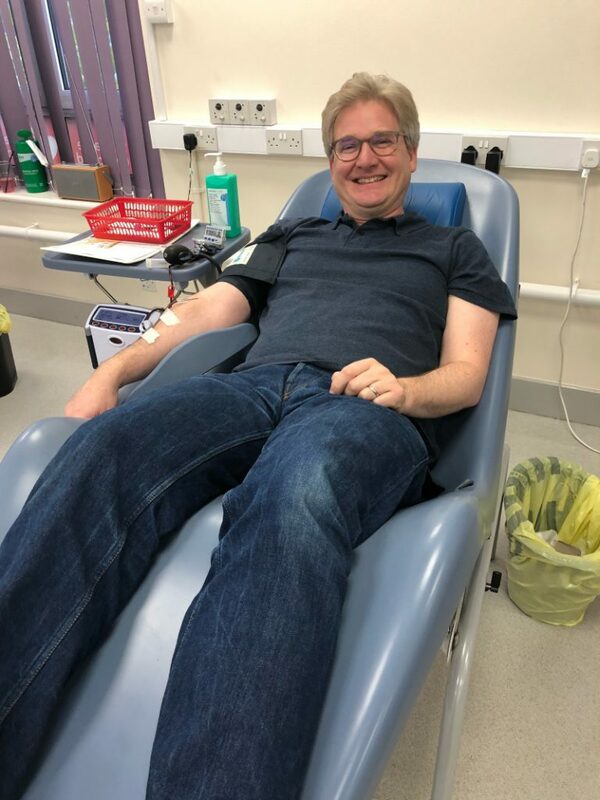 You’ll get a text shortly after, thanking you for giving blood, and a couple of weeks later you’ll receive a text informing you of your blood type and confirming the hospital your blood has been delivered to (pretty cool!). Not long after this, you’ll receive a welcome and thank you pack including a red donor card and a key fob. You can also log into your donor account at any time to see how many times you’ve given blood so you can look back at your wonderful achievements. Scott’s blood was put to good use at St Thomas’ Hospital, London and Barry’s blood was successfully delivered to the Royal Brompton Hospital. Both are blood type O- so their blood is always in demand! Regular blood donors are given gifts to mark important donation milestones to show just how much their donations are appreciated. If you make 100 donations, you’ll be invited to attend a prestigious ceremony with other donors and there you will receive a ruby donor card, commemorative medal, badge and certificate. 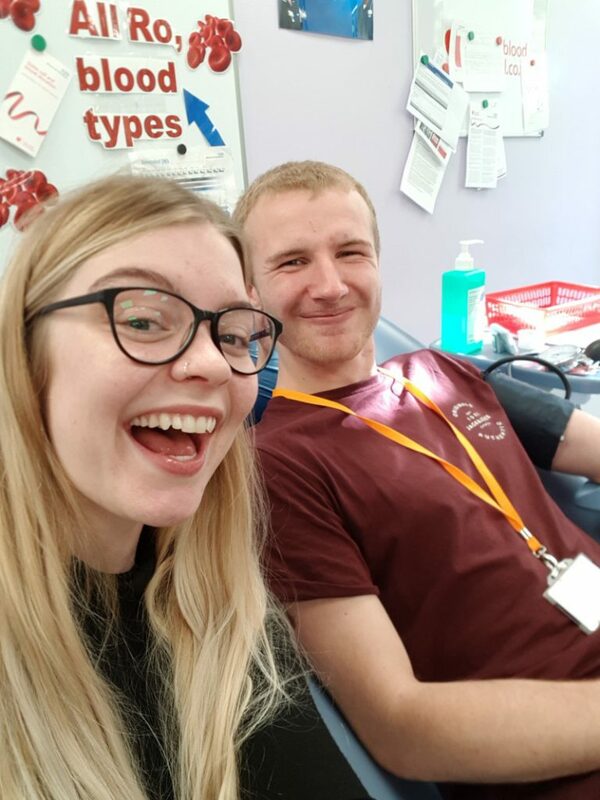 Happy they’re officially blood donors! If you’re nervous, why not go with a friend first to see what it’s all about? We guarantee it’ll put your mind at ease. If you’re already a donor, keep up the good work this year!